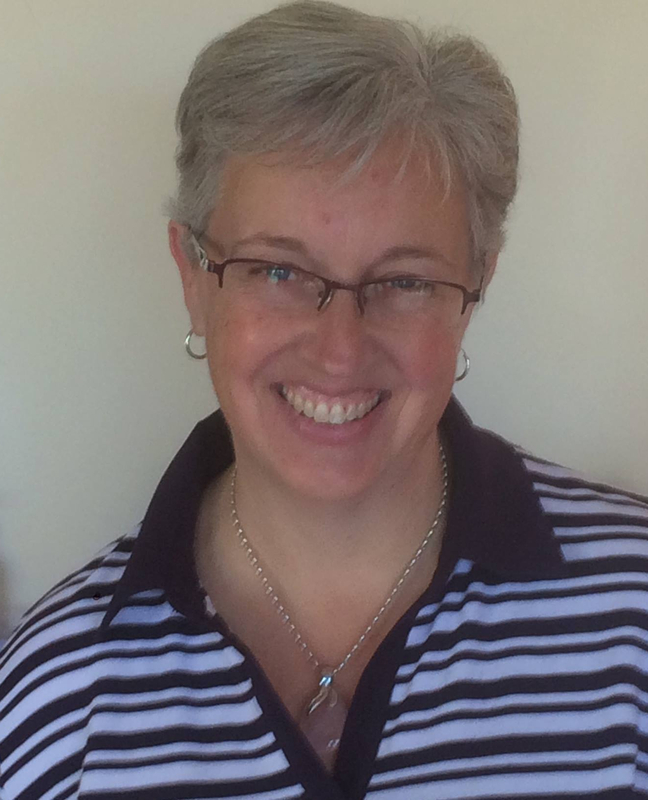 … but phew, what a week… or two! Some of those dreaded “change of season” bugs hit our household full force over the last couple of weeks. My poor husband had a week off work (totally unheard of) and my son was sick with it as well – at the same time, of course. And then just when they were starting to get over it, I got sick with a very nasty tummy bug that saw me visiting the emergency unit of the local hospital. Fortunately it was only a short stay, and I managed to escape the hospital the same day that went in. But recovery has been a bit of a slow process, and I am now on some medication which seems to be helping, although not quick enough for my liking. Being unwell is just soooo not me, especially when my mind is willing but my body just isn’t. So, needless to say, I have a million more ideas running around in my head, but have only had the energy to make a few of them. 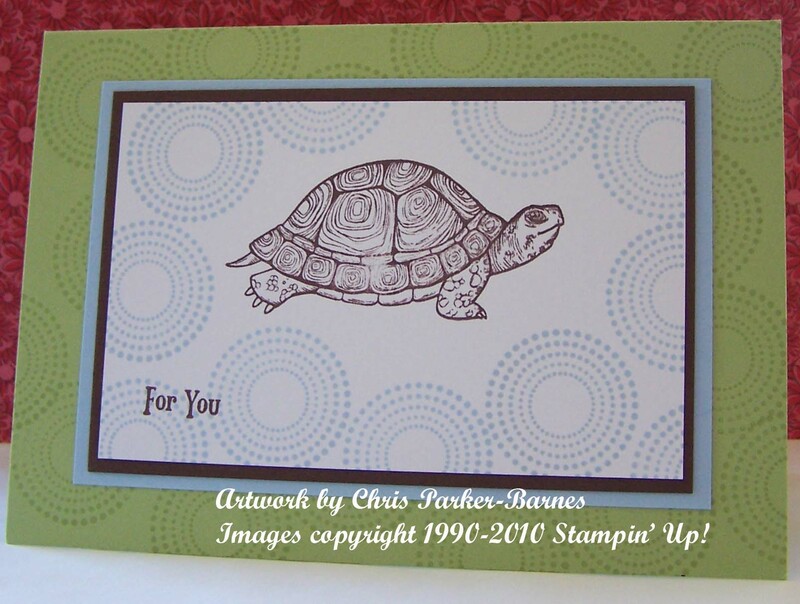 I did promise to share some more of the cards I made using the Seeing Spots Stamp Set, which I will do shortly. And I also have to share some of the excitement of the amazing new Autumn /Winter Mini Catalogue which goes live on the 1st of April, but as a demonstrator, I have been lucky enough to see. Actually, I have spent quite a few hours with it firmly adhered to my forehead! It is gorgeous!!!!! I desperately need the lotto gods to bless me with very large amounts of cash that I can spend on all of the mini catalogue, because to honest, I think I could buy every single thing in it. I will come back with another post with some details on the new clear mount stamp sets, but in the meantime, some cards. As well as Seeing Spots, this one uses the lovely Nature’s Nest Stamp Set which is only available until the end of this month. And the greeting is from the Sale-a-Bration set Vintage Labels, again only available until the end of the month. Cardstock is Certainly Celery, Bashful Blue, Chocolate Chip and Whispers White. 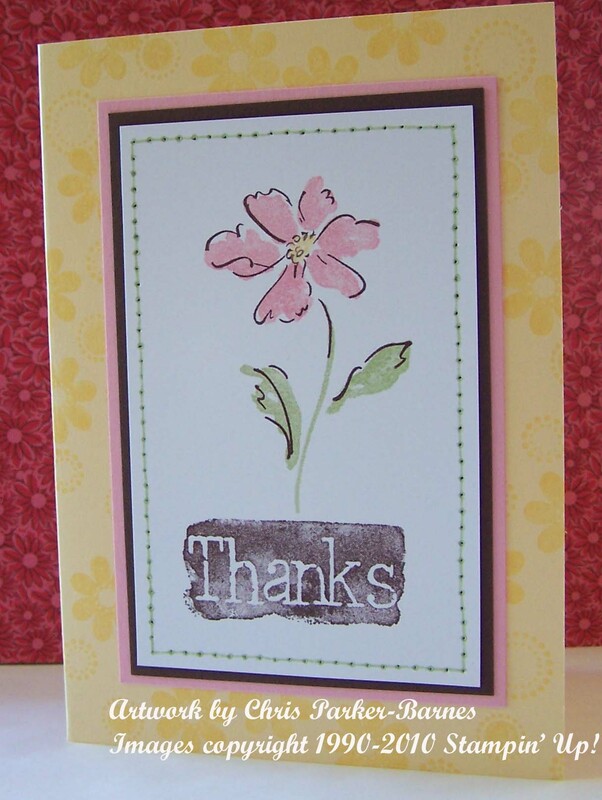 This second card uses the Heartfelt Thanks Stamp Set, in the colours of Barely Banana, Pretty in Pink, Certainly Celery and Chocolate Chip. 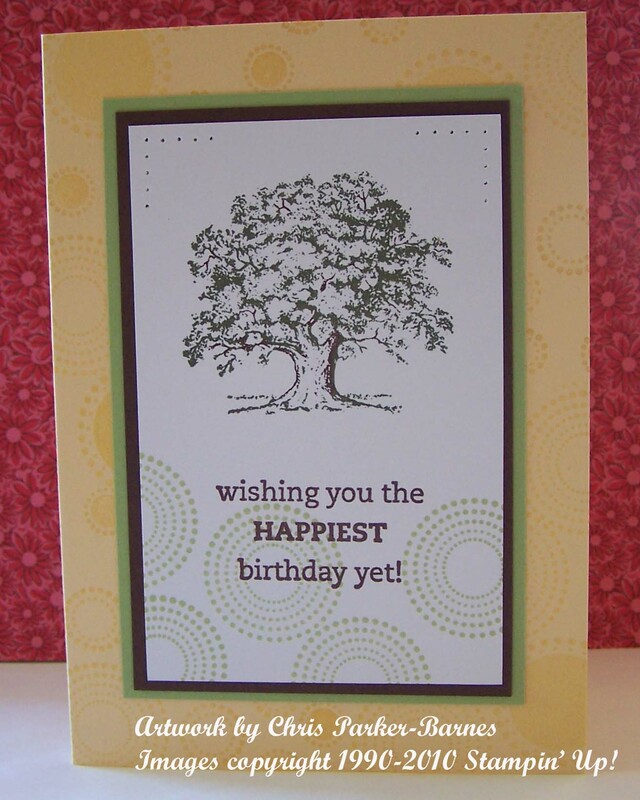 And this last card using an all time favourite of mine, Lovely as a Tree, along with On Your Birthday for the greeting. The colours are Barely Banana, Certainly Celery, Chocolate Chip and Whisper White. 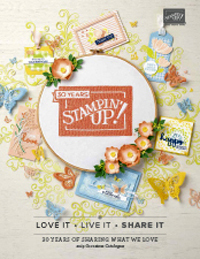 Hope you are getting lots of stampin done, and for those of you in Canberra, enjoy your long weekend! What a great stamp set! On Sunday I held a Stamp-a-stack using the Seeing Spots Stamp Set, which we combined with Wow Flowers and Starring You, and the soft subtle colours of Pretty in Pink, Barely Banana, Certainly Celery and Bashful Blue, with a little Chocolate Chip. I cut the cardstock into kits, but then we mixed up the colours and changed things around and ended up with lots of different cards in different colour combinations. It was lots of fun. Here are a couple of the possibilities, but trust me, there were plenty of other ideas too. Stamp Sets: Seeing Spots, Wow Flowers. 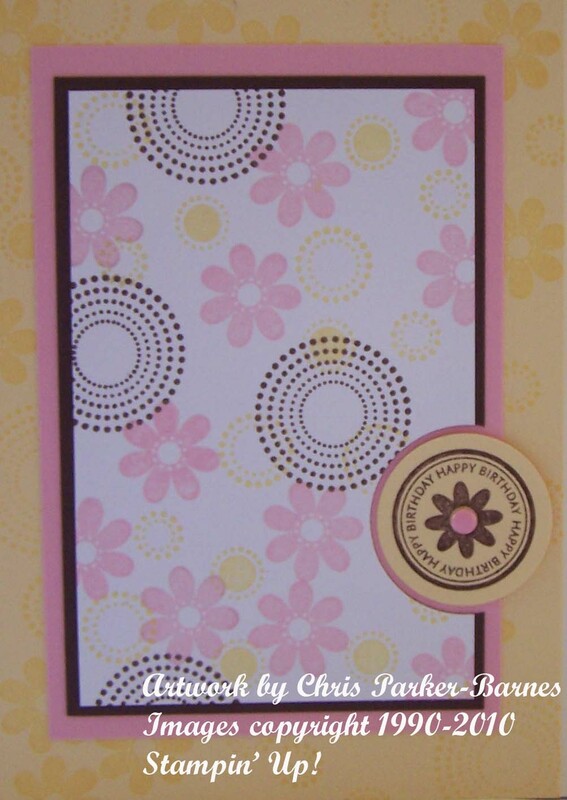 Cardstock: Whisper White, Chocolate Chip, Pretty in Pink, Barely Banana. Inks: Chocolate Chip, Barely Banana, Pretty in Pink. Accessories: Soft Subtle Brads, Silver Brads, Large and Small Oval Punches, 1 1/4 inch Circle Punch. While they were all busy making these, I made some different designs using Seeing Spots as a background, so I will be back shortly to show you how some of those worked out. I have been so busy over the past few weeks that I have missed out on making something for the Saturday Cinema Creative challenge, (it is worth checking their site out, there are some truly beautiful cards there, great for some inspiration, and this week are offering some blog candy 🙂 a delightful stamp set called Branching Out from Taylored Expressions). It is a lot of fun, and I find it a good way to do some things that I wouldn’t normally, and my card for this challenge is certainly totally different from my usual style. This week’s movie is the James Bond movie, Goldfinger. I am not a James Bond fan, and this is another movie I haven’t seen, so once again I had to use my limited knowledge and interrogate 🙂 my ever supportive and helpful husband. The Martini Glass is a clip art image which has been printed onto vellum and then cut out. I have then used a Versamark pen to go around the edging and emboss with gold powder. I have then adhered the bottom of the glass to the cardstock, and used glue dots on the top part of the glass which I have pushed out to make it rounded like a real glass. The second photo will show you what I mean. Stamp Sets: Seeing Spots, One of a Kind. Cardstock: Basic Black, Vellum Cardstock. 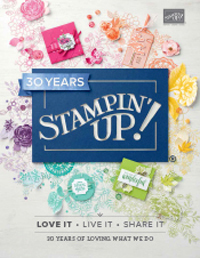 Images copyright 1990 – 2009 Stampin’ Up!